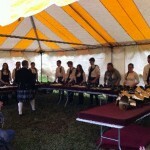 It was an honor to be asked once again to play forthe Scottish Festival in Bridgeport, WV. It was a bit rainy, but we had a tent to keep us (and the audience) dry. 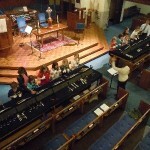 It was a great festival and a great day for ringing – and we thank Chip Smith (former Student Conductor) for the photos! ALL of the ringing ensembles at Southminster rang their end ofthe season concert following a great dinner in Fellowship Hall. Ringers 3 (directed by Essi Efthimiou), ringers 2 (directed by Mark Etzel), Ringers 1 (directed by Rich Pinkerton), the Women’s Handbell Team (directed by Cynthia Donahoe) and our newest ensemble, the Alumni Ringers (directed by Samantha Reid). It was a great evening of music and fellowship and a fitting conclusion to the end of a fantastic ringing year!